In the IFT app we saw that interfacial tension gets dramatically smaller when HLD=0. It turns out that to effectively sweep out oil from a well with water, you need a high Capillary Number which is proportional to 1/IFT. Going from a typical IFT of 1 to an IFT of 0.001 automatically gives a 1000x boost the Capillary Number. If you needed a 1000x boost by other means you would have to increase the flow velocity or viscosity by that amount - a much harder task than adding the right surfactant package. Pump less water but with a very low interfacial tension (IFT) between oil (or contaminant) and water. There is no right answer - it depends on circumstances. But generally it gets so hard to remove via the first two methods that eventually a surfactant-based method is required. As we will see, for the surfactant route just throwing in any old surfactant will not work. Only at super-low IFT do interesting things start to happen. And to get super-low IFT requires HLD~0, i.e. you need to choose the surfactant Cc in terms of the temperature and salinity of the soil plus the EACN of the contaminant. φ0 is the original level of oil/contaminant and φhi is the plateau level at high flows - remaining oil is there for other reasons. CB is the Capillary-Bond Number (sometimes called the Trapping Number), CBcrit is the critical value where stuff starts to happen. n is an exponent that controls the shape of the curve. Given the assumption that the oil is being pumped upwards so that gravitational effects work in the same direction as capillary effects, the driver for removal is CB, (Ca²+B²)0.5. If the Horizontal option is checked then the Bond number is set to zero so CB is identical to Ca. In the app you get to enter U, r, γ, Δρ, η as the physical parameters. Then you enter the two values for φ along with a critical value for CB. Because this can vary by orders of magnitude, you enter a log value. So if CBcrit=0.001, i.e. 10-3 you enter -3. It comes as no surprise to find that a typical 2-order of magnitude reduction in IFT (from 4 to 0.04mN/m) that can be achieved by choosing the right surfactant to give HLD~0 is a very effective way for sweeping out oil or contaminants. 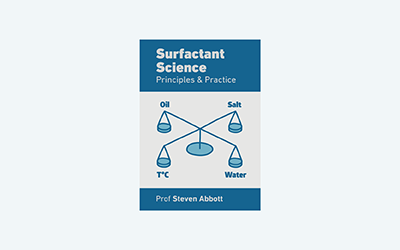 This notion of critical capillary or Bond numbers permeates surfactant science. The use of the Eötvös number (=B/2) for detergency is shown in the Eötvös Roll-up app. Other approaches via critical Weber numbers have also been shown to be important for contaminant removal.